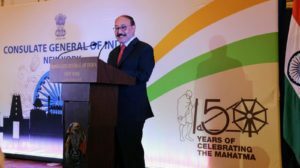 India’s Ambassador to the United States Harsh Vardhan Shringla speaking at the ‘India for Humanity – Role of Jaipur Foot’ meet at the Indian Consulate in New York, on April 4, 2019. Photo courtesy: Indian Consulate in New York. NEW YORK – The Indian Consulate in New York and Jaipur Foot USA organized an exhibition and seminar titled ‘India for Humanity – Role of Jaipur Foot’, to commemorate the 150th birth anniversary of Mahatma Gandhi, on April 4, 2019, at the Consulate. India’s Ambassador to the United States Harsh Vardhan Shringla was the Chief Guest, at the meet. Prominent attendees included Dr. Paritosh Prasad, great-great grandson of Mahatma Gandhi, who was the Guest of Honor; Lot Dzonzi, the Deputy Permanent Representative of Malawi to the United Nations; Sadia Faizunnesa, the Consul General of Bangladesh; Robert Lancia, State Representative of Rhode Island, and Capt. Stanley George of the New York Police Department. Prem Bhandari, President of Jaipur Foot USA, speaking at the ‘India for Humanity – Role of Jaipur Foot’ meet at the Indian Consulate in New York, on April 4, 2019. Photo: Peter Ferreira. Prem Bhandari, President of Jaipur Foot USA, spoke about how India’s Ministry of External Affairs and Jaipur Foot have built a rewarding partnership. He said Jaipur Foot is carrying Gandhi’s message of humanity throughout the world by providing mobility to people, by giving free of charge prosthetic limbs to the poor and destitute in India. A film on Jaipur Foot’s ideology and mission was screened. Bhandari informed that since Bhagwan Mahaveer Viklang Sahayata Samiti (BMVSS) was founded in 1975, nearly 1.75 million differently abled people have benefited through 73 camps in 30 countries. He noted that Jaipur Foot USA has zero administrative cost and donations go directly to furthering the work of the organization. Dr. Prasad, a physician based in Rochester, NY, spoke about the lessons learnt by his grandfather Arun Gandhi in the lap of the Mahatma, who took him under his tutelage. He narrated that Gandhi taught Arun Gandhi how emotional and non-physical violence could be more hurtful than actual physical violence. “It is in the actions of Jaipur Foot and the incredible gifts they give, identifying the need and meeting that need, choosing not to ignore all of our fellow brothers and sisters as we walk this life together, that is the greatest way that we can cherish what we have been gifted from Bapuji and reinvigorate our responsibilities to carry that teaching and way of life into the future,” he said. Shringla, in his speech, highlighted that ‘India for Humanity’ was formally launched by Sushma Swaraj, India’s Minister of External Affairs, on October 9, 2018, in honor of Gandhi’s service to humanity. Shringla said that because of the program at the Consulate there will be four artificial limbs fitment free camps – in north east India by Kanak Golia, one camp in Agra by Rajiv Daga Family who came all the way from Houston to attend the event, and one camp each in Patna and Jamshedpur by Jaipur Foot USA. Shringla also spoke about Gandhi’s focus on environment and his message that man should be compatible with nature. “Mahatma Gandhi was the first advocate of sustainable development. In the UN, there is a lot of emphasis on the UN Sustainable Development Goals but Gandhi, more than a 100 years ago, was already expounding on the concept of the need to stay within the environment,” he said. The Consul General of India in New York Sandeep Chakravorty spoke about the contribution of Jaipur Foot in changing lives and becoming an “international brand” for India. Faizunnesa and Dzonzi commended the work of Jaipur Foot, who has helped people in their respective countries. Faizunnesa also spoke about the close ties between India and Bangladesh, expressing gratitude to India for supporting the humanitarian action taken by Bangladesh in supporting the forcibly displaced Rohingyas from Myanmar. “We thank India profusely for its very proactive humanitarian role in that sector also,” she said. Dzonzi said that Jaipur Foot was able to change the lives of 500 people in his country. Indian American teenager Sparsh Shah was among the attendees and gave a rendition of the popular bhajan ‘Vaishnav Jana To’, at the meet.